This is just a quick follow up from our previous Alaska posts (see Alaska Data and WellDatabase Takes on Alaska). Here we will outline the data we have available for Alaska and a quick view of the data at a high level. First we will take a look at the production data for the entire state. There are a few wells with a small amount of production prior to 1960, but the data really kicks into high gear after that. For this reason we’ll filter the data to start at 1960. 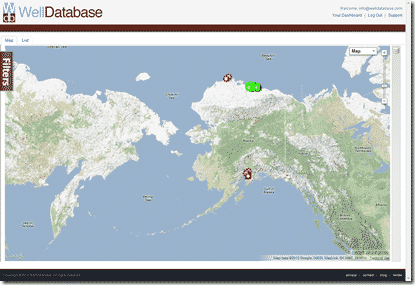 Using WellDatabase’s analysis tools, you can easily see the trends in Alaska drilling. Basically a few wells are drilled in the early 1960s and the number of producing wells sticks around 60 until 1967 when it starts to jump (albeit modest) up to about 200 in 1969. The number then hovers between 200 and 300 for nearly a decade. In 1977 the count jumps from 261 to 385 and by 1980 there are 524 producing wells in Alaska. After that things really start to pick up and by 1990 there are 1688 wells producing in Alaska. From there on we see decently steady growth with 2350 wells in 2000 and then 2834 wells as of March of 2012. When we overlay the production data we see the large spike in oil production that coincides with the well count increase in the late 1970s. The increase continues throughout the large increase of drilling in the 1980s and then tends to decline as a whole while the well count continues to rise. In contrast to the oil decline, the gas production has continued to increase following pretty close with the increase in the number of wells. The dips in the gas production are very consistent and look to happen during the summer months. Without any great insight, I will assume that it has something to do with things not being completely frozen and wells being shut in for various maintenance. Any insight to this is welcome in the comments. We will zoom in on the past 12 years and get a better look at the trend. As we did in Louisiana, we are going to dive into some more recent data in Alaska. First, we will filter out the data for wells spudded since January 1st, 2011. Since there has not been a significant amount of activity, we can see the individual well spots from the higher zoom level. Since it looks like most of the activity has been in the North Slope, we’ll zoom into that area. From a quick look we can see that the bulk of the wells spudded in Alaska in the last 18 months have been oil producing wells. This makes complete sense given the current economic climate. 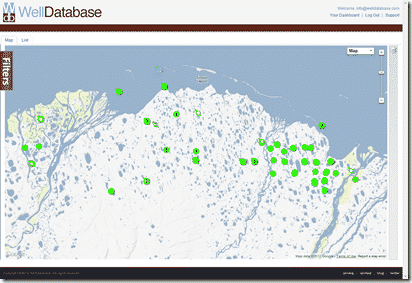 Alaska checks in with a big amount of oil & gas with a relatively few number of wells. This massive state is still fairly unexplored and will most certainly be a big target for future drilling. There of course are several legislative hurdles, but when the time comes, WellDatabase will be there cataloging all the data.